DAN MULLEN: As you wrap up signing day and get ready to catch your breath it's awful nice to be able to go home and have it be 80 degrees out here in Florida. That's why it's great to be a Gator. Exciting day for us. A lot of good things happened today. I think with early signing and with it split like this, with signing day, you don't get to go through as many guys. But a really great day for us when you look at some of the additions we had today are huge for us, huge for the future, big pieces for the future of how we continue to build this program and not just in guys on the field but the character of guys off the field. And you look at a guy of, you talk about character off the field and talk about the family and how important it is, as guys talk about what a family program we have and how the families are very involved in the decision. I'm really excited about that because I think that when you look and a lot of the stuff that goes on in recruiting parents come up here and see what our program's about, how their sons are going to be treated and taken care of, treated as part of our family, but also see beyond the field, at the University of Florida, and what the University of Florida means to them, not just about playing football on Saturdays in the Swamp, but the education that you're going to get, which is the best education in the Southeastern Conference, with the alumni base, with the connections, the networking that it's going to give you for your future beyond football is so special. And I'm really excited. And the character of what guys believe in in the program. When you look at a Diwun Black‍ that comes out and says, what do you feel about your commitment to Florida? I'm committed for infinity, I think is his one tweet was. So but really talented players and really excited for our future for the guys that are joining the Gator family. So questions. Q. How significant is it just for today and for the long-term being able to beat out basically Alabama and Georgia for two key recruits? A. Well, I think what we're trying to build. As I said we are here to build and bring back a program that competes regularly for championships and you've got to have good players to do that. If you go back and you look at the championships in the mid-2000s here, there were an awful lot of talent on those rosters. So recruiting is a major part of it. Developing, coaching, all of that is a big part of it. But also having the talent and a lot of that comes into recruiting. So I think that's huge for the program and it just shows the direction that we're headed as a program. I think the commitment our staff makes at recruiting, the quality of coaches that we have that are able to recruit, we spend a majority of today meeting and watching and recruiting in the 2020 class already and preparing for this time next year. So I think that's huge for us and those are, right now those are the teams that played for the SEC championship this year and that's the level we want to be on. So being able to win those recruiting battles is going to help to hopefully beat them on the field as well. Q. I know you don't put much stock in rankings, but this will put the Gators in the Top-10 for the first time in five years maybe. The funny one is, though, if you look at that in rankings in theory then, we probably shouldn't have finished No. 6 in the country this year so. But I think they're part of it. I think recruiting rankings, part of it is good, but it's also what, you know, it's more important what they become. And for us, because I also, I don't always get too caught up in all the rankings because there's guys, to be honest with you, out there that there are a lot of people, you don't call out one site or another, recruiting sites and all the different rankings systems that are out there, that I'll look and that we have ranked much higher than maybe other people do. And there's ones that have guys that we have ranked much lower than people outside of our staff do. So within our evaluations, I kind of trust our evaluations and we do and there will be some that -- I've gone in the past and looked at guys and said, hey, this guy's ranked as a five-star player and we just don't see that. There's other guys that we ranked as a three-star player and we'll sit there or two-star player. And I've sat in a staff room before and said, you know, this guy has no offers, he's not ranked very high. And we'll watch and I'm like, does anybody see -- you know, I rank him here a, position coach ranks him here, the coordinator ranks him here, we go around the room, does anybody see anything different? We have this guy ranked much higher. So, you know, hopefully it continues to translate. I mean for us, I want to build a program that's consistently ranked in the Top-10. I think this, very rarely do you see teams maybe that are going to go compete for championships that are unranked, unranked in the college football playoff. Unranked, unranked, in just regular seasons. It's teams, you're in the Top-10 consistently and that you have that year where you go make the playoffs and you're winning championships and so we want to consistently be a Top-10 program in every aspect. Q. After the early signing period you said your two remaining needs were corner back and defensive line. And then after that, you lose your two assistant coaches at those positions and yet you guys still sign two top-50 guys at those spots. You won a lot of recruiting battles, but just how proud were you of winning those? A. I think it shows about the two assistants we hired, maybe. I'm really excited about the guys that we have brought in on our staff. And you get the early signing, you have a high position need, and you bring in new coaches at that position and you immediately you address that. But I do, I am really excited. I know when you look at the guys we hired, you look at David Turner, a guy that has tremendous experience in the Southeastern Conference. But the great thing for me I think that there's a lot of times you can see guys have maybe a reputation out there or a guy can get on a board and draw pretty good and then they get on your staff and it's not all what you think it is. The great thing with David Turner is I know I've had him on my staff before. I know his ability to go out and recruit top talent. I know his ability to develop that and coach it. If you look at his track record of NFL superstars that maybe weren't the highest recruited guys, if you look at -- I always love the Chris Jones recruiting story, who when he finished his high school football, I think he was a zero star, but he did end up being a five star before signing day. But, so but you take a guy that really wasn't a big name guy and all of a sudden right before signing became it and develop him to really one of the top players in the NFL and he coached him and Fletcher Cox the same way, as well as a bunch of other guys that have played for us. But I think that and his development goes beyond. He and his wife and the family atmosphere, how they take the kids in and the connection that he has with those players is special. So really excited about him and I think the impact he can make on our defensive line. Here, not just the players that are here, but in the future in recruiting as well. Torian [Gray], one of the most I've never been in a situation where we lose a coach and basically every player on the team starts texting me, is there any way we can go hire this guy? And I'm like, okay, and then I'm like, you know kind of I had never met Torian and, but everyone of our players was like, but we have to get him, we have to get him. And I'm like, okay, well, he's currently the secondary coach of the Washington Redskins, so that sounds like a really good idea, but you know he was here and he went to the Washington Redskins. So I love the thought process behind that from our players. But as I started to research and as I talked to people, both in college and several people in the NFL about him, I thought, well, wow, it's a really unique deal of how highly everybody spoke of him. And one of the things that brought him down and got to meet him and his personality and be around him and see how he fits in our program. Because I think it's one that everyone, the current players speak really highly of him, guys that have worked with him in college say boy, what a great recruiter, great personality as a college coach. Talked to guys in the NFL and talk about his development and his ability to develop young players and all of that sounds great, but you also have to make sure they fit in within your program and your staff. And then his personality of how he fits in. I think we, I think for us it was, they're two great additions that have the ability to make us better immediately and long-term here in our futures. Q. Obviously with recruiting classes it's a group of guys. I don't mean to single out anyone, but as you know Alabama has kind of made its living by coming into the Sunshine State and getting guys now two years in a row. You've beaten Nick Saban and his staff on signing day for a guy that they were really coveting. How key is that for you as a program to start winning those battles? A. I think it is huge. I mean we are the University of Florida. I think for young men in this state, the opportunity to go -- you know what, there's, this coming Friday is a huge deal, because there are acceptance letters going out on Friday here at the university and there will be a lot of celebrating, like we had in our office today, about having people come to Florida. But there's also going to be a lot of people celebrating the opportunity to come to the University of Florida around the state. And you're talking premier students. I think that the young people in the state realize what a special place this is. Not just for the football side of it, but a special place as a university and what it can mean for them. I think when they look at their school and when the valedictorian of your high school they're jumping up and down and celebrating that they have the opportunity to go to the University of Florida. And here's somebody else that's worked their tail off in the classroom and they're an athlete. And so the premier student and the premier athlete in school and hopefully someone that's premier in the arts at the high school, and they're all celebrating together that we have the opportunity to go to the University of Florida and go to the premier university in the state is something special. I think for the young people, and I see not just, like I said, not just playing here, but it's the other doors that it opens for you, the connections that it makes, the networking that it's going to have. And for our guys that -- today's exciting, they got to put the hat on. But a couple years from now they're going to get to walk across the stage and hang on their wall -- they will probably keep that hat. This was my signing-day hat and right next to it more importantly is the degree from the University of Florida that they get to complete the full circle the power of what it is to be a Gator. Q. Jonathan Greenard was a guy you added last month. How important was it in terms of getting him? A. I think it's huge when you look at your roster and you look at CeCe [Jefferson], who goes on and he's graduating and going to the NFL, you can't always project everybody else and Jachai [Polite] makes a decision to declare for the draft and leave early, kind of leaves a big gap at that spot. And to get a guy that with Jonathan coming in that has that experience, that has played at an extremely high level, that has been productive and can make an immediate impact, you look at some of our young guys that have the potential to do that with a Mohamoud [Diabate] that's on campus, Khris Bogle who we signed today, Lloyd Summerall is a pass rusher coming off the edge. We think those guys are going to have bright futures. But in the immediate they're still, they, they haven't been through it at this level and hopefully they are going to be able to make an immediate impact with us when they get here. But you're talking about a guy that has shown that he can do it at this level and is going to be ready to go play when we kick off the season next year. That's really an important addition for us. Q. What is kind of your overall philosophy on transfers when it comes to building roster? You obviously benefited quite a bit last year as well. A. Absolutely, well one of the things, whether it's a transfer, to me that also includes a lot of like junior college players as well, you know. We bring guys in -- and I sit with them, it's -- recruiting is a decision that you're looking and your family and there's a lot that goes on and you take all these visits and then it's very much a long-term decision. You're spending the next four years, three, four, some guys three maybe, but four to five years on campus and doing those things. When you look at grad transfers, you're looking at one year on campus. Or junior college players, it's a much more condensed window of what you look at. So to me you're not looking at programs where somebody, okay, this program can develop. I can have the opportunity to play short-term and develop me to be great long-term. A lot of times you're looking at a transfer is what's my immediate? Am I getting on the field immediately? So usually when I'm dealing with transfers, you're looking at immediate needs to play. I'm not looking to just build depth. I think a lot of people I look at, guys sometimes that programs like, boy, they transferred to a school and you know sometimes you wonder, you feel bad for guys. They're transferring to a school and they're going to add depth or be a backup at that program instead of have the ability to immediately help. Ours is if we're going to take a transfer, it's to take someone that's going to make an immediate impact. Q. The kid [Arjei] Henderson from Texas. How did you guys end up with him? And I know he had decommitted a couple times from a couple different schools, so what was your thought process in taking his commitment and how worried were you about him? A. Well, until the papers come through, you're always checking on things. But Arjei is a guy that we recruited early, had shown interest early, had committed elsewhere, and but we would always stay in contact with. I think one of the things that he wanted, that helped is him getting around some of our players at the All-Star Game and communicating and talking to those guys. 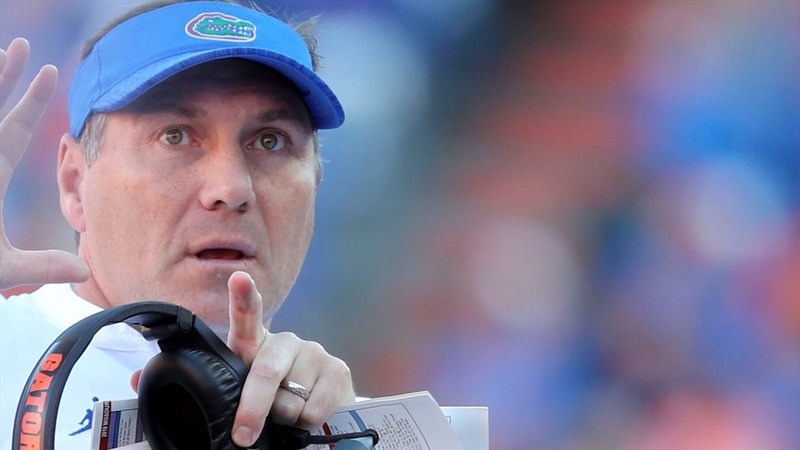 And he really came out and came out strong and said, coach, I really want to commit to Florida. And I'm like, okay, but having -- he committed places, I said, you know, I kind of went through more the why. And he's a guy that jumped. When he said he jumped all in, the great thing is from the second he committed he's been awesome. He's been solid as can be in everything. Helping us recruit and what he does, obviously he's a very, very talented player, got tremendous ball skills as a wide receiver, and big play potential. One of the things to me that was huge is, as you said, like how confident do you feel when that happens. And from that day he and his family have been all Gator. So that's -- one of the things that you get to see that you respect a lot is when guys -- in the recruiting process I love guys that, everyone handles their process differently and it is, and there's a lot of pressure put on these young guys. I think a lot of people look and there's guys doing press conferences today and all of this and everybody forgets these are still like 17-year-old high school kids. And even though they get this attention and all this hype, there's lots of pressure that go on them. One of the things I love is guys that when they say something and it constantly follows through with what their word is that they're going to say. I have no problem with guys and guys change their mind, that's okay, sometimes that happens. But when you have conversations with them they're never wishy-washy conversations. This is why I'm doing what I'm doing. This is what I see. And this is -- you'll have guys commit and decommit. But I like guys that will decommit and say, coach, this is why I'm doing it. I have no problem with that. You would be shocked some of the conversations. Guys call and say, coach, I'm going to decommit, here's the reasons I'm decomitting, and I say okay. Coach, I still really like your school, and I want to pay attention to your school and here's how I see this process going moving forward. And I love guys that even though they committed and decommitted and this, as you see the process moving forward, and you see it work out the exact way they say. I have a lot of respect for guys that do that. I think those are guys that you feel confident are going to have good futures, too, because when they have a vision, they say they're going to do something, and they follow through with it in what they're going to do. Q. You guys really addressed the edge rusher position. Fair to say the interior defensive line is probably the biggest focus for 2020? A. That's going to be a focus for us is, is guys that, especially position flexibility. Not just the big guys inside, but the guys that can play end or tackle, a little bit bigger bodies, is going to be a huge part of this upcoming recruiting class for us in 2020. That, receivers is going to be a big aspect for us, with four senior wide receivers on the roster this year. Q. If you could put a percentage on the recruiting you did between signing day A and signing day B on 2020's class and 2019's class. Was it like 50/50 or? A. Well, if you go by numbers, no, because we're only, we were only recruiting a very small number of people between signing day A and signing day B for the 2019 class. Now we put a lot of effort into those small number of people. So time, you're very -- probably still more to 2020. But the amount of time you put in per prospect is much heavier in 2019 than 2020. But you're also limited. The thing is as the head coach you can make one visit to the prospect. Well, for the 2019 guys that means over that time frame there were only a couple of prospects I visited of 2019. So the majority of time you're going to see 2020. Only a couple prospects you're recruiting, where in 2020 you're recruiting an enormous amount. So you're probably spending a lot more time that way, even though time per prospect would be way heavy the other way. A. It's interesting. I think like everything it will go through its cycles. I mean to me for all the prospects when you look at it, is, again, you get to the whys. I certainly hope as people look at the transfer deal that they have a legitimate reason for why they are doing it. I've never had a problem with a guy, one, first off I look at it. I want guys that want to be here at Florida, want to be Gators. I think that is really important to our program, you know, and if you don't want to be, then it's, that's not fun for anybody. Our program's -- we're pretty demanding and we have high expectations and high standards here and want guys that really want to be a part of it. Now, guys that transfer doesn't mean they don't want to be a part of it. There's lots of different reasons that go into it and I love, I have no problem with guys transferring if it's all for the right reasons. One of the first things if a guy ever comes into me and says, coach, I'm thinking of transferring. I know it might be easier now than it used to be, but to me I don't view it any differently. I would make it just as easy a year ago or two years ago as I would today for guys. I just hope that you always hope it's for the right reason. I think that you hope today that they don't make it -- the new rule, everyone says it makes it easier -- does it allow guys to potentially transfer for wrong reasons and not for the right reasons. And I think that can be harmful for the development of young people. And it puts them in bad situations that they might not want to be a part of. Q. And do you feel like getting to know these players that you feel pretty good about that part of it, you know what I mean? A. Yeah. I think you know why. You know, I mean it's -- one of the -- I always go back and I learned as a younger coach, to me in the transfer rule and throw people up, but you know at the University of Utah you had Alex Smith as our starting quarterback back and he took over after Brett Elliott had been our starter and got hurt in a game. At the end of the season Brett Elliott walked in my office and he was older than Alex, and he said, coach, I'm thinking about transferring. I said well, that will put us in a tough situation, because we didn't have any other quarterbacks on scholarship and the only guy, we had a guy named Brian Johnson committed to us that was going to be, that was 16 years old at the time coming in would be the only other scholarship quarterback. And I said, Brett, I'm going to give you every opportunity to earn the starting job in spring. And he said, I know you will, coach, I believe in you, of course you will. He said, but here's the thing, Alex Smith is a really good player and he's younger than I am and if I don't earn that spot and beat him out and, which I might, I might not, I'm not afraid to compete, not afraid of anything, is, I'm sitting the bench with, he goes, and I love to play. I want to be on the field. I love Utah, I love the program, I love you guys as coaches, and I want to play. And he said, I don't ever want to sit here and look and say, my best opportunity to play is one of my best friends to get hurt. I said, you know what, that's a great point. And so we kind of went through everything, and he ends up transferring and ends up being a first team All-American and winning the National Championship at a smaller school. And I think from that day, as a young coach, I learned a lot of let's sit down and go through all of the reasons why and why that made sense. That made perfect sense. It ended up being really good for him. It hurt the depth within our personal program at the time, but it worked out to be really good for him and his future. So from that point I've always from this day built on that on transfers. First guy I want to transfer I said, why, where do you want to go, why do you think that's a better option for you, what are the issues. And I wanted this jersey number and I'm not wearing that jersey here. I said okay, well listen, that's a terrible reason. I've been here for six weeks, you know, and oh, that's not a good reason. Like I tell my kids, start and finish the year. A good time to transfer is, I've had guys come in and say I want to quit. You know, don't come in mid-March and say okay, let's finish it through and guess what? Let's finish it through and at the end of the semester let's look at something. If this isn't for you, here's why it's not for you, and let's find something good, but learn a lesson to just kind of finish. There's little segments that make sense for when you should look at those things. But to me that's all part of developing and parenting. One of our jobs on campus is to try to be a, somewhat be a parent model for a lot of the players that come here. We're not going to replace their parents, but we're going to be in that mold and helping them. So I treat everybody how I would want my own kids treated and the same way I would talk to my kids about making those decisions. So I just hope that it continues to move forward. I think it is good for guys because there are a lot of guys where there could be something that's a big positive that for them to be at a different school or a different program for the right reasons and you hope that that's why -- it continues down that path for people to make decisions in that way. Q. During the early signing period you say defensive back depth is something you got to address in January. Two weeks later you got Chris Steele going on national TV announcing that in 48 hours he's going to be an early enrollee. What's that process like for you as a head coach and what are you getting in him? A. Chris has done a really good job since he's been here and especially with the opportunity to enroll early for him is going to get him invaluable experience. When you look, especially with Marco [Wilson] still going to be coming back in spring, and not a hundred percent, he's going to have an opportunity to very much run with the 1s. And if you look at last spring, with Trey Dean coming in and getting reps with the 2s and getting a lot of reps with the 1s during spring ball, if you would have asked me this time last year boy are you going to have, do you think Trey Dean's going to start 10 games or 11 games for you as a true freshman at the corner position? Probably would have said, boy, that would be a stretch for us, but the opportunity he would have would be there for him to get that experience and get ready to go play. And I think Chris walks into that same situation right now where, because of some injuries, because of how we're going to move some things around, with the departure of Chauncey [Gardner-Johnson] at the star position for us, that Chris is going to have that opportunity to get reps that are going to prepare him to be ready to go play and it was really good that Trey got all that experience in spring because lo and behold after three plays of game two, he was the guy. And so I think Chris is really walking into that situation. Trey's a guy we're going to looking to move to the star position potentially to fill that void that since Chauncey's leaving us moving forward which leaves an opportunity at corner for us to have guys that we need to go get reps for. And I think corner depth moving forward in spring is we need that depth. Last year if you looked, I think I mean C.J. [Henderson] was a guy, boy can I return punts? No. Can I return kicks? No, you're already playing 70 some plays. I would rather you not even play all the plays you're playing at corner for us and keep you a little bit fresher as the year goes on, but we didn't have the depth and Trey as a freshman had to go do that a lot last year. So I think the depth that we have brought in and the opportunity for these guys to play and the experience they're going to get in spring is going to allow us that depth moving forward at the corner position to potentially say, C.J., go catch a kick or a punt every once in a while or hopefully have him even be a better player next year because -- what's amazing is I expect him to have a better year and play less. Because we have built the depth up. Q. You mentioned Arjei helped recruit other guys to the class or whatever? A. I think other guys recruited Arjei and then Arjei being as positive as he was was huge. Q. How big is that to have the class recruiting each other and is that something you guys push? A. I do, I think the guys make relationships, I think if you look at Diwun Black and the amazing job he, the positiveness of the person and the personality and how that can draw other people in and Diwun's an amazing story, I can't wait to get him on campus for us. He's one that just like Arjei but if you look and with all the stuff he's been through he goes to the Poly Bowl and puts on a show, but I think he's got that personality that as they go recruit, people want to be around. So I think that is huge and I think as guys look and these guys get to know each other travelling around and you look and I think even if you look in the state of Florida, there's a lot of great players in the state of Florida, a lot of great high school football players if not one of the best states, if not the best one of the best certainly in the country of high school players here. So it means a lot of a bunch of guys they get together and look and say, hey, we are from Florida and we're going to go to the University of Florida. And we're going to represent the Gator Nation and represent this state and go make a statement and those guys kind of stick together and recruit each other and stay together, that's huge. That can help lead to championships and put the Gators back into national prominence as a team that competes for championships on a regular basis. Q. Can you talk about any specifics with [Kaiir] Elam and [Khris] Bogle and what you think won them over to come to Florida. A. Well I think a lot of the guys that comes in, you look at Bogle and Khris Bogle especially, the family atmosphere of the program. That they have very close families, they have a great family unit at home, and I think when they come up on campus and see one of the things we talk to our guys about in recruiting is the development of what we're going to do and they see how, what our standards and expectations are, how hard we're going to push them, on the field, in the classroom, and those expectations. I think we stay away, our staff, a lot from a lot of the fluff in recruiting sometimes. But on top of that they do see the family part of the program. Of how coaches' wives and kids are around, how we have them over to the house. That feel how, if there is an issue that they're going to be taken care of. That they see that no matter what the situation, in our program -- to me, when I tell them, I don't tell the families, I'm responsible for your son's development as long as he's a first team all-conference player. Our commitment is, you know, when you join the Gator family, we're responsible for your development no matter what happens. And they look at maybe a guy like a Randy Russell, who joined our program and all of a sudden a week after being on campus his dreams kind of in one part of his life are shattered, yet he's still a major part of our program, so much so he was voted on to the leadership committee of our team by his teammates. And I think when a lot of the families, they come and they see that family aspect that we have here, of our commitment to developing young men, not just to be champions on the field but off the field, in the classroom, in the community, in every aspect of their life to develop them to become the best that they can be, I think that that is a very comforting feeling for families that have looked and worked and these young men that have looked and worked to make themselves successful in not just one phase, in every part of their life and have high aspirations for every part of their life that they see that they can accomplish that here within our program and that we embrace that and that we promote it and that they know that they're going to be taken care of here. I know there's been over a thousand in the portal. Which, I don't know, it will be -- it would be interesting to see how all this shakes out for everybody. There's a lot of little details to it that I don't think everybody's experienced yet that go into that. That it will be interesting to see how that all continues to play out in the future. I saw there's a kid in the portal one day and out the next. Or I don't know. We'll see. Q. So what kind of versatility do guys like [Diwun] Black and [Tyron] Hopper particularly bring to the defense? I mean I saw Diwun Black, his stats blew my mind he had like 12 picks and three touchdowns as a sophomore? A. He was a six three and a half 225 pound safety. That gives you a lot of flexibility right there. But one of the things we look for, we even talked about where we're doing a lot, we're watching all the film doing a lot on 2020 class and one of the things we look for is where do you add position flexibility. The reason being is that one you don't want to be locked in that you can only play one player, you don't know where our needs are for the team, where we think this -- we might -- we're not always perfect in recruiting, where especially you look at guys that are great athletes and we say, okay, I project this guy to play this position. Right? And he comes and he's not very good at the one you thought he would be, but he's really good at something that you didn't, maybe you didn't think he would be at. So position flexibility is huge. And then the other part of position flexibility it allows you to create matchup problems. You look at a guy like even on our team, Kyle Pitts, what position does he play? He's kind of a tight end that plays wide receiver. That's a tough matchup on people. I still to this day don't know if people can define what position Percy Harvin ever played here. You know? Was he a receiver, was he a running back, was he, you know, because, right? And it's, because it's a mismatch problem. Kadarius Toney. Boy, there's a lot of different little things we can do with him that creates matchup issues for people. So as a coach I love guys that have position flexibility because we can put you on the field and you can create matchup problems for other teams. And I think when you do those things, that's a huge advantage for you and so when you look at a guy like a Diwun Black like a Tyron Hopper that have DB's that played corner and safety, that have DB athleticism and physicalness and size to play linebacker, those are tough matchups for offenses. And it allows you a lot of time so that if you look on the defensive side of things and say, hey, okay, what position is Kyle Pitts going to play? Doesn't matter because I have a guy that can match up to him in either spot. I have a guy that can match the size to him. So you want to move him into the core, good, we're going to make this guy play linebacker. You're going to move him out of the core, good, this guy can play DB and we don't have to sub with you and get caught in a mismatch advantage the other way. So I think that's why it's huge for us. Q. Speaking of that, how do you foresee some of these guys maybe fitting in a that safety role and providing depth there, maybe guys like Kiel or Steele or Kimbrough? A. Well one of the things is, for me, is we had some decent depth at safety, last year, at the safety position. The Star is the one to me that we got to go create the depth for. The stars and the corner more for that, that's why I look for those guys with the ability to come in and play corner for us right away for us on the perimeter because that gives you the flexibility to move, to get one of the corners into going to the star position. And safety's going to be a bigger need for us moving forward in recruiting, more so than now because you have every one of our safeties comes back, with, you know, so I don't think that's a huge immediate need for us right now. Q. And then building off what he said, when you have guys out there that are recruiting alongside of you have you had any of them bring you someone that maybe wasn't on your radar or not as high on your list? A. Absolutely, well you know what I check, when these guys go to camps and a lot of times they will go to these all-star games and I'll ask, tell me about this guy and I've, we have, more so than not, you eliminate guys than take guys, to be honest with you. Like, coach, that's not a guy that's going to fit in our program. That's not, his attitude his demeanor this is a guy that got in a lot of trouble, this is a guy that I don't know that we want around our team. This is a guy I have question marks about. Especially guys you really trust that have been in the program and you know and you know their personality, you know why they make decisions and they say, I question this guy's motive, his passion, whatever it is, there's little things. But it does work the other way, where I have guys that are at the all-star games and they say, coach, we should recruit this guy. One, he's interested. Because a lot of times you go these all-star games and you're looking and everybody's got offers from around the country, but they say, hey, this guy is really interested in us. Okay. Legitimately interested. Okay. And I ask why and he says, hey, and we really should recruit him, because of this, this and this. Boy, he's the hardest working guy, he's the toughest guy for me to cover, he's the toughest guy for, you know, he was the toughest guy to get open on, I tell you what. You go to one-on-one pass rushing, nobody can beat him. That type of mindset, the leadership of guys, it is, it's interesting and you hear that from the players and I like to hear what the players have to say. I do, after recruiting weekends, I always go ask our players what they thought about the guys that were in here visiting us and what their thought about those guys were. So all of that is part of the evaluation process during recruiting.